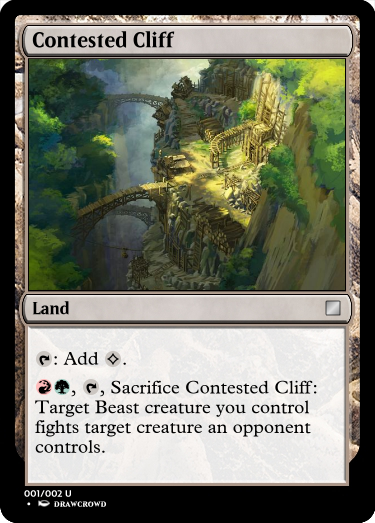 , , Sacrifice ~: Target Beast creature you control fights target creature an opponent controls. Quick judging because I totally forgot about this challenge: Your winner is HvT for a deceptively useful downshifted Bazaar of Baghdad, with Zuty as runner-up! It's been over two months, so as runner up I'll step in with the new challenge. 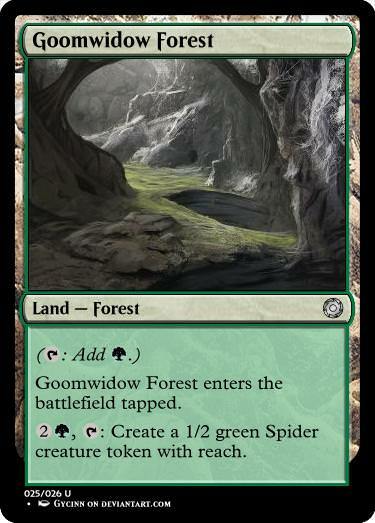 Design an land with a basic land type. Remember that ALL entries must have a render as per the rules. Any entry without a render will be ignored. Borderplains Outpost enters the battlefield tapped. 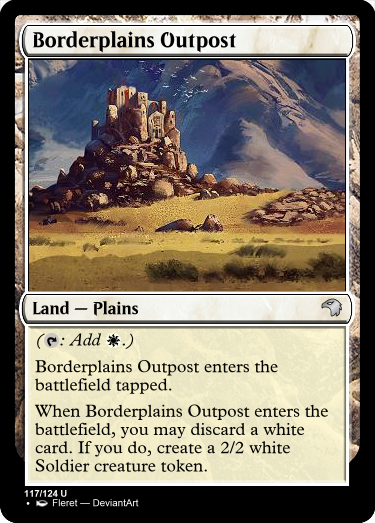 When Borderplains Outpost enters the battlefield, you may discard a white card. If you do, create a 2/2 white Soldier creature token. edit: well, I suppose this isn't a wip anymore since the contest is closed. Whoops. Whenever a green creature enters the battlefield under your control, you may sacrifice ~. If you do, put a +1/+1 counter on that creature. It has been two weeks now and I'll keep it short, viriss is the winner. Being able to get a 2/2 on T1 at the cost of discarding a white card is really nice. I'd love to see a cycle of this. The other two entries were great as well. 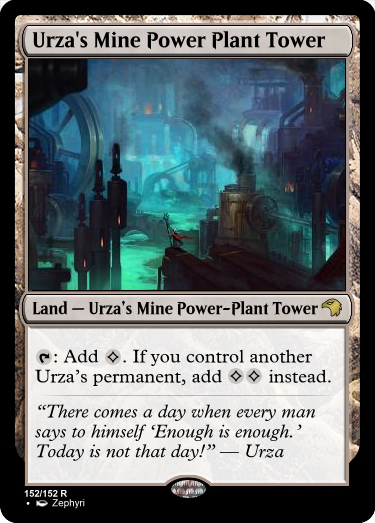 Next challenge: design a land that gets better the more you have of something else, like the Urza set. But probably stay away from Locus. 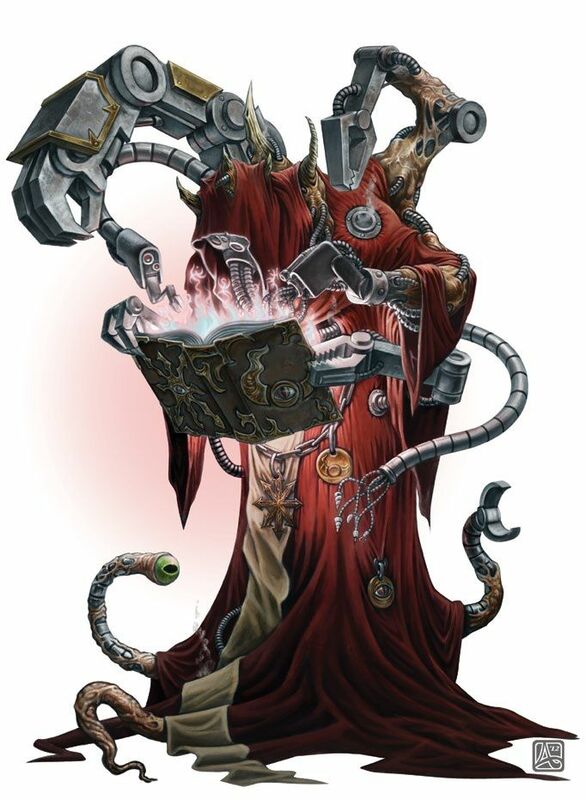 , : Add to your mana pool for each instant and sorcery card in your graveyard. 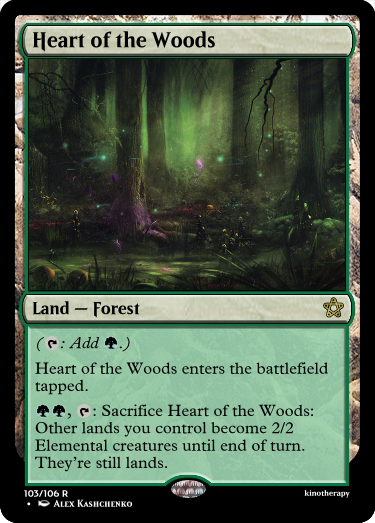 Spend this mana only to cast instants or sorceries. 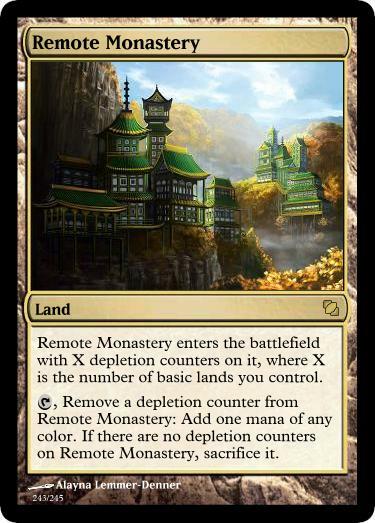 Remote Monastery enters the battlefield with X depletion counters on it, where X is the number of basic lands you control. , Remove a depletion counter from Remote Monastery: Add one mana of any color. 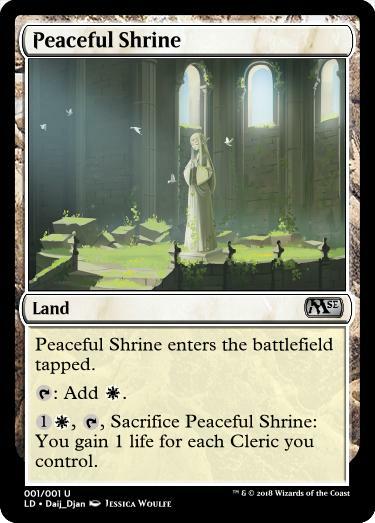 If there are no depletion counters on Remote Monastery, sacrifice it. : Until end of turn, ~ becomes a white Horse creature with “This creature’s power and toughness are equal to the number of creatures you control.” It’s still a land. All it ever wanted was a friend or two, or seven. I know this doesn't count, but i had to. 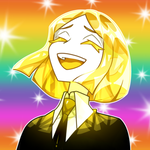 Daij_Djan I take it that's zelda art? Looks pretty great, for what it's worth. @ZephyrPhantom: According to the artist's comments, they were indeed inspired by Zelda. Whoops, missed judging this one. Thanks for the win viriss! 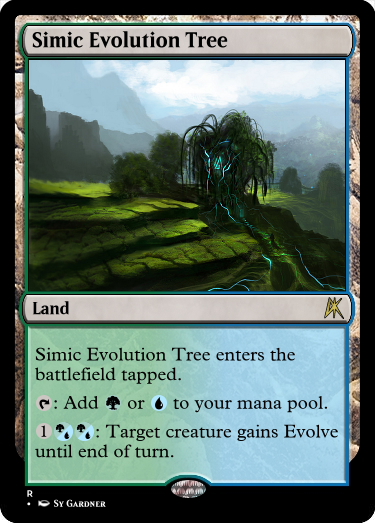 Next challenge: Make a land with a hybrid cost on it! 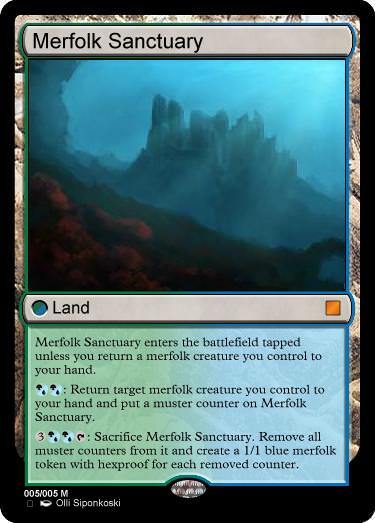 Merfolk Sanctuary enters the battlefield tapped unless you return a merfolk creature you control to your hand. G/U G/U: Return target merfolk creature you control to your hand and put a muster counter on Merfolk Sanctuary. 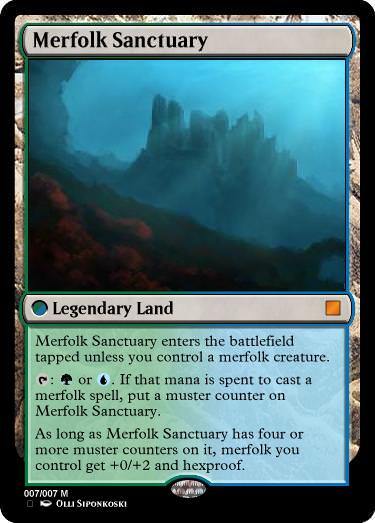 3 G/U G/U T: Sacrifice Merfolk Sanctuary. Remove all muster counters from it and create a 1/1 blue merfolk token with hexproof for each removed counter. bagz This has a few issues: first, you can't remove counters from something that's no longer on the field. You could put that part in the activation cost of the ability, or you could remove it entirely and look at the number of counters that were on it when it was sacrificed. Second: Your Merfolk tokens don't have a card type, they only have a subtype. 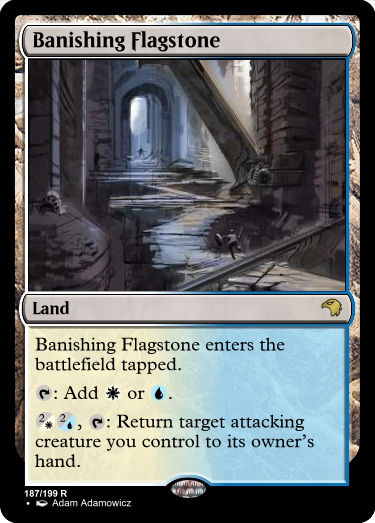 Third, it doesn't make mana, which breaks rule #1 of modern land design. And lastly, it's really weak, which is just my opinion, but I think several people here would agree with me. Funny you posted this 11 minutes before I looked for the first time today. I highly agree with all of your critiques and will be redesigning it per that and a conversation I had a w a friend last night. I think you can join the middle two lines. T: Add G or U. If that mana is spent on a merfolk spell, put a muster counter on ~.